Luxury brands tend to value their products based off of scarcity and quality, while knockoffs are produced in mass quantity and made with the lowest quality materials. Luxury brands, as well as government agencies, are allocating a lot of resources to towards combating this problem. However, the methods that they have devised are built around distinguishing their products from other knockoffs, such as using holograms, special tags, and unique packaging, rather than getting at the root of the problem. Unfortunately, these are only temporary solutions, as counterfeiters are able to do what they’re best at and produce counterfeit holograms and tags to go along with their knockoff products. The permanent solution: Blockchain Technology. Using blockchain technology, the entire lifecycle of any product can be monitored and tracked with decentralized, tamper-proof digital ledger, all while maintaining an owner’s privacy and security. Essentially, every luxury good will be authenticated with blockchain. A luxury brand that implements this technology will make it virtually impossible for counterfeiters to mimic their products due to the level of transparency they will be able to provide. In fact, an article recently published on Coindesk.com claims that “Two subcommittees of the U.S. House Committee on Science, Space and Technology — for Research and Technology, and Oversight — will meet on May 8, a newly published notice reveals. The hearing is entitled ‘Leveraging Blockchain Technology to Improve Supply Chain Management and Combat Counterfeit Goods.’” This proves that governments across the globe are recognizing the potential benefits of blockchain technology in this space and are exploring implementation methods and strategies as we speak. Luxury goods are usually the result of several elements brought together from disparate sources. This is the pure essence of what luxury goods represent — brands design their products with the utmost care and are highly selective in the components they choose to incorporate, creating more value in the final product. For the overwhelming majority of consumers, access to information about where their goods come from is at an all-time high. This transcendent level of transparency will propel luxury goods to entirely new levels. 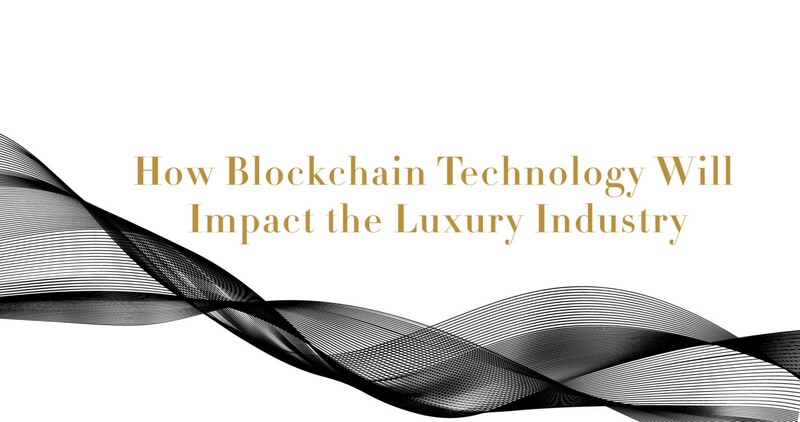 A luxury good that has been constructed and transacted on the blockchain will provide all of this information directly to the consumer, completely revolutionizing the purchasing experience. The idea of being ‘woke’ has bloomed among millennials, and that applies to luxury goods as much as anything else. People are becoming much more conscious of where their luxury goods are coming from. Most people are willing to pay more for a product with an ethical and authentic narrative behind it. For example, picture a child’s lemonade stand set up in front of a supermarket. Anyone walking into the supermarket has the option of purchasing a glass of lemonade from the child’s stand for $1.00 or walking into the supermarket and purchasing quadruple the quantity of lemonade for the same price. Nine times out of ten, the customer will purchase lemonade from the child because it will make them feel better to do so. This new level of transparency will also indirectly enforce ethical and environmentally sustainable practices within the luxury industry. As mentioned, people have increasingly become conscious about where their products are coming from and it’s not only their food, it’s everything! The diamond industry has begun to use blockchain to keep track of a precious stone’s history. A blood diamond, one mined in a conflict zone, has far less value than one that has been mined ethically. Blockchain technology can expose unethical practices within an industry the same way it will wipe out counterfeiters and pirates thus constructing a platform of trust and traceability that will greatly benefit the industry in the long term. Blockchain can create an entirely new channel of communication between brands and owners. Brands have had great difficulty projecting their product narratives to their audiences. If a customer can find out that the luxury watch they are considering purchasing consists of specially designed parts from several different countries, and has been hand-assembled by a world-renowned team in the industry, suddenly they discover the true value of the watch. These tangible qualities are of the utmost importance for both consumers and brands alike. Brands will be able to identify their customers and which products individual customers own, which has not been possible due to third party retailers not recording this information. Furthermore, they will be able to clearly project the message out to their customers that they deeply care about their relationship with them and they have provided this much transparency to prove it. Luxury goods are becoming more, well, luxurious. Brands have been haunted by counterfeiting parasites for far too long and this will eventually all come to an end as more and more luxury brands embrace blockchain technology. Over time, as blockchain is largely implemented and scaled, the number of counterfeiters will gradually thin out and eventually be no more. This will reinforce the concept of valuing products based on scarcity and quality since cheap knockoffs will be completely wiped out from the market. The only luxury goods available for sale will only be the specific number that was produced and distributed by the brands or their authorized retailers. No more, no less. Furthermore, luxury brands will be able to save a huge amount of time, money, and resources that they have previously allocated towards finding solutions to this problem. Now that they have discovered the ultimate solution, they will be able to redirect their efforts towards their actual products, which will result in an increase in product quality and sustainable efficiency. We want to start off by acknowledging that the Arianee team is very well aware of the emerging number of ICOs and blockchain projects tailored towards the luxury goods market and the wider supply chain application of blockchain. The Arianee team is also very well aware of the staggering number of brands that exist in the world today, which will be virtually impossible for one supply-chain based blockchain project to handle. Finally, the Arianee team is very optimistic regarding the demand for blockchain technology, specifically within the luxury industry. We have the utmost confidence in our leadership, and have already established partnerships with several different brands, announcements coming soon! With that being said, Arianee aims to build a universally structured, open-source trustless platform that brands and consumers alike will be able to utilize to authenticate a product, track its life cycle, transfer ownership, and communicate amongst one another. The Arianee mobile application will serve as a valuable tool especially for consumers simply because of the ease of use, applicability, and security. The blockchain community will inevitably distinguish Arianee from its competitors because of the numerous features it will provide, including Arianee certificates, encrypted digital vault, unique smart-asset technology, community business partner toolkit, and massive data hub.